15 years ago Rally Finland 2003 had a number of winner candidates, but two of them were to be taken more seriously than others: Then three-time Rally Finland winner Marcus Grönholm and the blindingly fast Markko Märtin. RALLIRINKI called both drivers and interviewed them for #ReliveRallyFinland2003. On pretty much every pre-event magazine interview and press conference, Marcus Grönholm and the other Peugeot drivers named Markko Märtin in Ford’s all-new Focus RS WRC03 as the main favourite to claim the victory. ”I think that was genuine fear from them, not just psychological games”, Märtin says now confidently. ”They knew how fast our new car was and they had seen some footage from the tests. That car was very, very fast on gravel”, Märtin recalls the preparations for the event. In early 2000 it was still unlikely for non-Finnish driver to be a favorite for the event. In the mid 90’s Tommi Mäkinen won the event five times in a row, in 1999 Juha Kankkunen took his last victory in Finland before Marcus Grönholm in Peugeot’s successful 206 WRC became an unbeatable match in 2000-2002. Alongside Märtin, Grönholm’s Brittish team mate Richard Burns had given Grönholm hard time the previous year before nosediving into troubles at the infamous Yellow House jump on Ouninpohja stage. Finns were so confident about local drivers’ performance that Rally Finland’s ad campaign in 2003 was built on the theme how foreign drivers lose – or get lost – even before the event even starts. Märtin, whose character played a big role in those ads, remembers that with no hard feelings. He thinks the campaign was to show Rally Finland no longer was a playground for Finnish drivers only. Märtin and Grönholm had a nerve-breaking battle for the first position for halfway through the rally. That fight ended when Grönholm had to retire. ”I remember being very disappointed. I didn’t hit anything”, Grönholm says. Markko Märtin admits now being relieved seeing the battle was over. 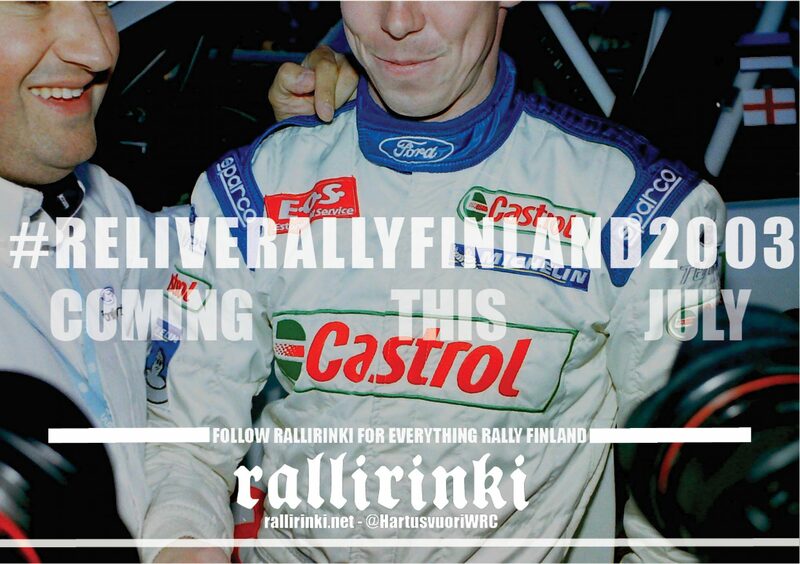 This week RALLIRINKI will relive the action that happened during Rally Finland 2003 through series of ”live tweets” from the event – written as if the event would take place right now. Tweets are written after a notable research into all material made from Rally Finland 2003, varying from magazine and newspaper articles to team newsletter, as well as to official organization and FIA documentation and correspondence. To accompany Twitter feed there will be also a blog post published every day. Full interviews of Markko Märtin (long in-depth discussion about the event) and Marcus Grönholm along with other insights into the 2003 edition of Rally Finland will appear here every evening from Monday to Sunday. Right after #ReliveRallyFinland2003 ends, Finnish group of rallying fans RALLIRINKI will turn their attention to Rally Finland 2018 and produce daily information through tweets from the event. Edellinen Edellinen artikkeli: #ReliveRallyFinland2003 – Rallirinki palauttaa 15 vuoden takaisen Suomen MM-rallin eloon – ja ensimmäistä kertaa Twitteriin!